A breached oil pipeline in Montana has spilled as many as 50,000 gallons of crude oil in and around the Yellowstone River, according to the state. Bridger Pipeline LLC has yet to determine the cause, but has claimed the public is in no immediate danger. Cleanup crews were at work on Monday to address the mess, which emanated from a break in the Poplar Pipeline system about 9 miles upstream from Glendive in eastern Montana. Bridger Pipeline said the rupture in the 12-inch steel pipe occurred early Saturday and lasted for one hour, dispensing no more than 1,200 barrels, or about 50,000 gallons, of crude oil. Oil has been reported as far as 25 miles downstream from Glendive, according to company spokesman Bill Salvin. Some of the crude is trapped under ice. 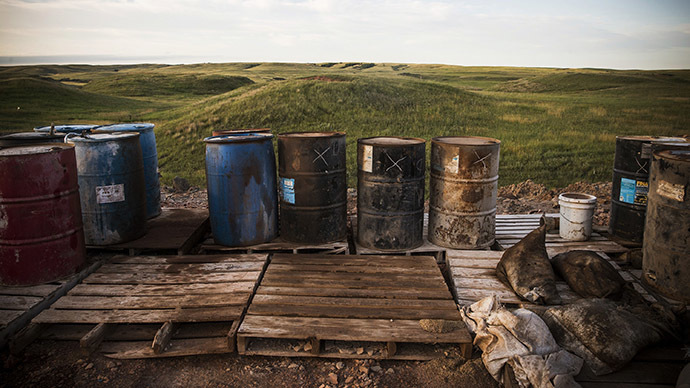 "Oil has made it into the river," Salvin said, according to AP. "We do not know how much at this point." While Bridger has claimed no immediate danger to the public, others are not so sure. "I am not saying the water is unsafe. I am not saying it is safe. We are waiting for officials to arrive who can make that decision," said Mary Jo Gehnert, coordinator of the Dawson County Disaster and Emergency Services, according to KRTV. The Montana Standard, meanwhile, reported that some local Glendive residents said there water could smell and taste oil in their drinking water. Bridger initially estimated on Sunday that 300 to 1,200 barrels of oil spilled before the company shut down the pipeline. “Our primary concern is to minimize the environmental impact of the release and keep our responders safe as we clean up from this unfortunate incident,” said Tad True, vice president of Bridger. State officials said the impact of oil in the Yellowstone River may be reduced given much of the water in the spill area is frozen over. The US Environmental Protection Agency and state Department of Environmental Quality have responded to the area, Parker said. Bridger Pipeline, a subsidiary of True Cos., based in Casper, Wyoming, said it was testing the water for contamination, according to AP. The Poplar Pipeline runs from Canada to Baker, Montana, carrying crude from the Bakken oil region in Montana and North Dakota. The pipeline was last inspected in 2012, according to Salvin, and rests at least eight feet below the Yellowstone River at Glendive. Bridger Pipeline also owns the Four Bears Pipeline System in North Dakota as well as the Parshall Gathering System and the Powder River System in Wyoming. In July 2011, a pipeline operated by ExxonMobil Corp. released 63,000 gallons of oil along the Yellowstone River. The company is now facing state and federal fines of up to $3.4 million based on damages from the spill. The company has said it has already spent $135 million on cleanup and related work, and it expects to pay out more money based on damages to natural resources in the area. The spill comes amid the high-profile fight over the Keystone XL pipeline, a 1,179-mile project that would transport tar sands oil from Alberta, Canada to the Gulf of Mexico. The controversial pipeline, owned by energy giant TransCanada Corp., is expected to receive a vote soon in the US Senate, while the US State Department announced Friday that it is giving eight pertinent federal agencies two weeks “to provide their views on the national interest with regard to the Keystone XL Pipeline permit application,” a department official told CNN over the weekend. The State Department is ultimately responsible for reviewing the pipeline’s permit application. President Barack Obama has stated his opinion several times about the project, saying it would “not even have a nominal benefit” to American consumers. His concerns echo those of other opponents, who say the pipeline would not result in much long-term job growth or energy security within the US while putting communities at risk for oil spills and other hazards to human and environmental health. Supporters, including Republicans in Congress, claim the Keystone XL would provide an economic boost while adding to America’s energy independence. Pending action in Washington follows a Nebraska Supreme Court decision earlier this month that overturned an earlier ruling that had held up construction of the Keystone XL. The state’s highest court reversed a lower court’s 2012 ruling that had previously determined that Gov. Dave Heineman's decision to approve a path for the pipeline had violated Nebraska’s constitution. The latest decision in Nebraska means official approval has been granted in all states included in the pipeline’s path.